I sat on the steps in the evening sunshine to shell the mountain of broad beans. Tess got a few that bounced out of the bowl but that’s fair game. 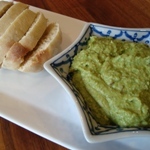 Don’t let the broad bean thing put you off as this dip looks and tastes like guacamole without the need for avocadoes. You can use up the bigger beans in this recipe. I spread it warm on a homemade bread roll but it would be good to dip raw radishes, carrot sticks and snow peas into. If you’re looking for a home for more broad beans, try a broad bean and feta salad. Must try adding some tahini next time. Steam the broad beans for a couple of minutes until tender. Drain and place with the other ingredients to a blender or small food processor. Blend until smooth. Season with salt and pepper to taste.